No matter what you use your Mac for, it’s fair to say that getting more done in less time is at the top of most people’s wishlists. Whether you’re easily distracted by social media or colleagues, or find it difficult to focus on a single task, there are solutions. And the good news is that many of them are available to you right now as part of your Setapp subscription. Apps like Lacona, HazeOver, Focus and Be Focused are there to help you be in the moment and concentrate on what you need to do. Rocket Typist stores snippets of text and types them out at the touch of a key, whereas Paste gives you access to multiple iCloud-based clipboards. How to be more productive using apps? From launching apps to translations to doing something on the web, apps like Lacona gets it done in no time. 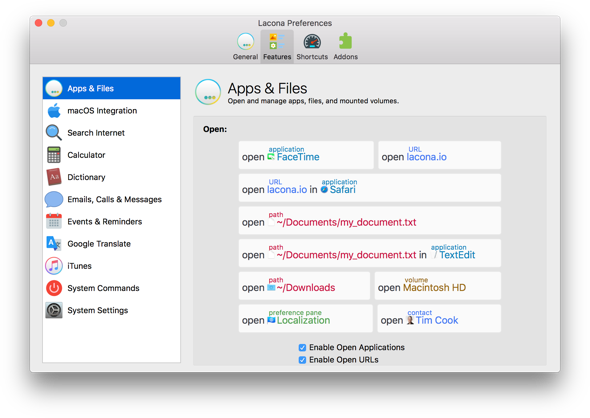 Lacona is the best keyboard assistant for any Mac commands. If haven’t already installed it, launch Setapp and search for Lacona. Click Install and, when prompted, give it permission to access your Calendar and Contacts. Test it. The default keyboard shortcut for Lacona is Alt–spacebar. If you want, you can change it by clicking on Lacona’s icon in the menu bar and selecting Preferences. For now, click Alt-spacebar and type “Remind me to [insert any task]” followed by “today” and a time. You’ll see a list of options appear below the Lacona text bar, with keyboard shortcuts next to each. Use the relevant shortcut to select an option. When you’re done, the task will be added to your macOS Reminders app. Use it regularly. As with any change to your workflow, getting used to Lacona takes time — you need to remind yourself to use it. You can search the web, translate text using Google Translate, make calls using FaceTime and control iTunes, just by typing text into its text bar. But first you’ll need to train yourself to rely on it. Click on it in the menu bar, then Preferences, and go through each section, learning the keyboard commands for every element you’d want to use. HazeOver puts a shade on the parts of the screen you’re not currently using. If you use a MacBook or MacBook Pro and are accustomed to working in full-screen mode, you won’t need it. But if you use an iMac or multiple screens and have several windows on display at one time, it’s an excellent way to stay focused. When the Preferences window appears, click on each tab and configure the options so HazeOver works the way you want it to. Then click Allow to open System Preferences and enable HazeOver in the Accessibility pane. When you’ve set it up once, it will work automatically. One technique for improving productivity is to work in bursts, focusing solely on one task for a period and then taking a break. 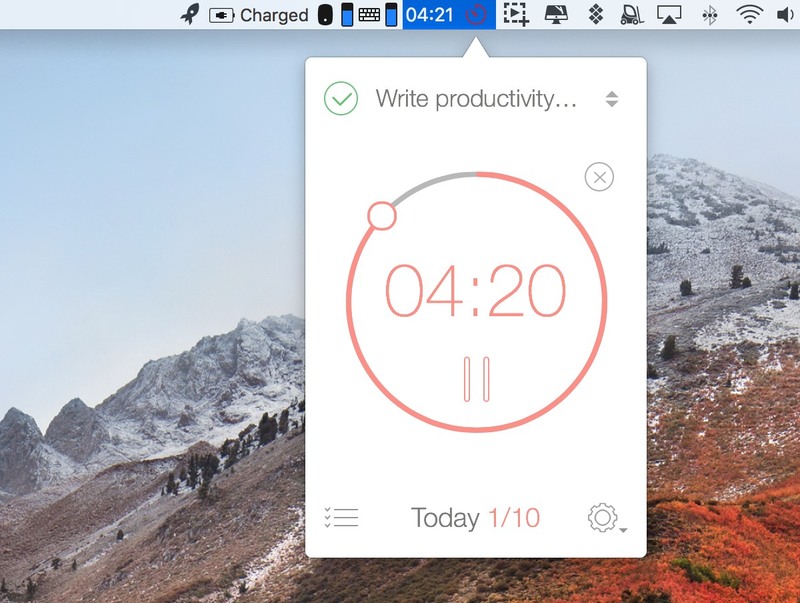 Be Focused allows you to do just that by setting timers for completing specific tasks. The idea is that you start with big goals, break them down into smaller objectives, then use those to create tasks. Once you have a list of tasks, you focus on one at a time and set a timer to help you avoid distractions. Add a task. Click on the “three lines” icon at the bottom left of the Be Focused window and then click “+” to add a task. Hit Return when you’re finished or “+” to add another. Start a task. Press the play icon next to the name of a task to start the timer countdown. By default, it starts at 25 minutes. However, you can specify whatever length of time you like in settings. 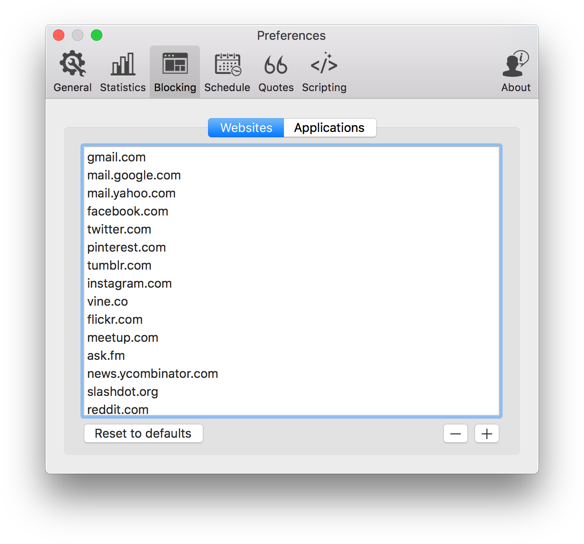 Focus automatically blocks access to popular websites and social media like Facebook and Twitter, so you aren’t distracted from work. It can also block specific applications, such as games. Focus sessions can be started manually or on schedule. You can run it for a set amount of time — the default is 25 minutes — or change your preferences in Preferences. Get Focus on Setapp and start blocking distractions. Click on the Focus icon in the menu bar (it looks like a camera shutter) and choose Preferences. Click on the Blocking tab and then Websites. Press the “+” button and type the address of a website you want to block. In the Blocking window, click Websites and then the “+” button. Navigate to an application you want to block and click Open. To start a 25-minute Focus session, click on the Focus icon in the menu bar and select the first option. To manually set the length of time, click Custom Focus. The macOS clipboard allows you to copy one element and then paste it somewhere else. Paste allows you to copy lots of different elements, store them in the clipboard, categorize them, search them, and sync them with iCloud. Copy items to Paste. Start by copying text you use often, like the introductory paragraph of an email, for example. Manage snippets. Items copied to Paste are called snippets. You can view them by pressing Command-Shift-V or by selecting Show Paste from the app’s menu bar item. You can rename snippets by right-clicking on them and choosing Rename. To add a new category, click the “+” in the list of categories and give it a name. To add a snippet to a category, right-click on it and select “Pin to,” then choose a category. Paste a snippet into an application. Right-click on the snippet, choose Copy then go to the application and press Command-V to paste it. Get Paste from Setapp to manage your clipboard, keep history, fast access to your snippets, etc. You can see there are lots of ways you can improve your productivity and get more done. And there are a lot of apps that can help you, especially if you are already using Setapp. Try them all for free and once you find the solution that works — stick to it and reap the benefits.